Pre-order your St. Patrick's 2012 Shirts! Our exclusive t-shirts are available now at a discounted rate! Pre-order yours here and pick it up at our T-Shirt Tuesday Party on March 13th, 2012. Please print out your EventBrite Ticket to claim your t-shirt on March 13th at de Vere's Davis or de Vere's Sacramento. *** Please make sure you select the correct location for pick-up during registration. Come grab a beer and get your St. Pat’s gear! 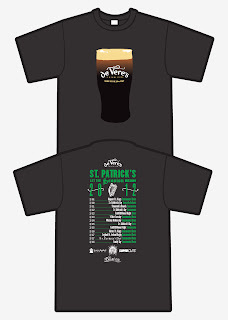 We’ll be serving our famous 20-oz pints and passing out de Vere’s exclusive St. Patrick’s 2012 Guinness t-shirts to those who pre ordered them. Join us for drink specials and a pre-session pint or two at your local pub! Pre-order t-shirts now so you won't be caught without your green on St. Patrick's Day! Pick up starts at 5pm.